I’ve never worn fragrance. I used to dabble in my mom’s Navy and Anais Anais, and slip my grandmother’s Chanel No. 5 out of her dresser when she wasn’t looking, but aside from playing around and wearing vanilla essential oil every day for like two straight years in college, I’m just not a perfume kinda girl. Lots of scents remind me of old ladies in my family, or give me headaches, or smell like hippies. Nothing against hippies – I just don’t want to smell like on on my wedding day… or… ever. So I started my search at Nordstrom’s perfume counters, with this ever-so-helpful request: “I saw a bottle at Sephora that made me think the perfume probably smelled nice, so I’ll know it when I see it.” After getting funny looks on my third trip around, and having sprayed myself with something really powdery and flowery, I moved onto Sephora. If you think Nordstrom’s is overwhelming, well, you ain’t seen nothin’ yet. That day, I smelled more stuff than I can remember, and went away with a sample of Thierry Mugler Angel. The first day I wore it, I hugged somebody and noticed her going, “Oooof” and crinkling up her nose as I turned to greet somebody else. Yeah… not the one for me. Back it was to Sephora, this time armed with a list of recommendations from their site’s fragrance finder, mostly from the “white floral” line. 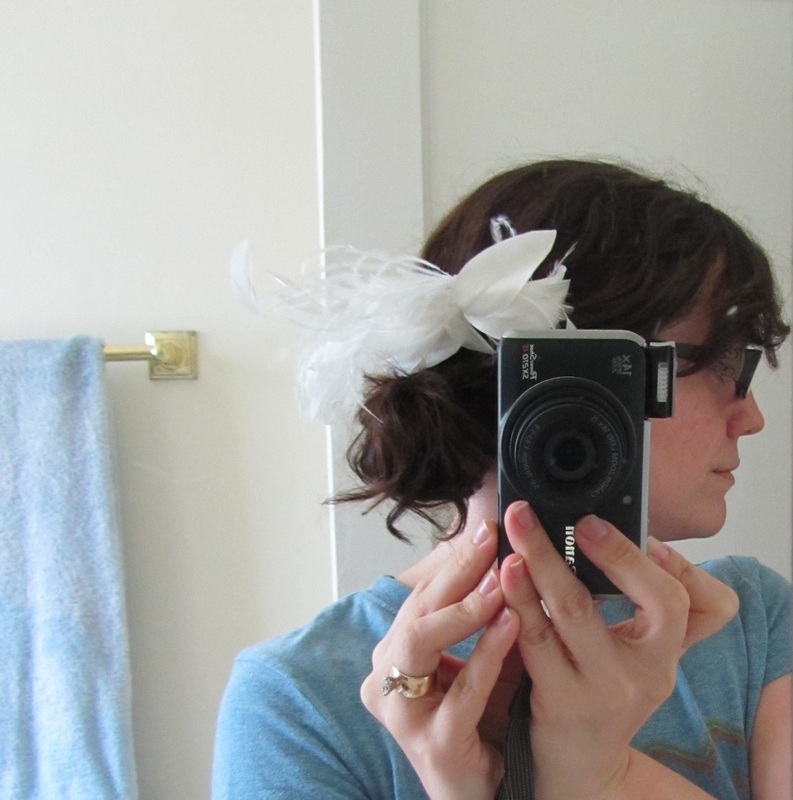 Since I’m getting married outside, I did want something vaguely floral. Just not sock-me-in-the-face floral. I sniffed all of them, and liked Marc Jacobs Woman and Tocca Florence the best out of the bottle, so I spritzed one on each wrist, walked away with samples, and proceeded to smell myself all day long. It’s really awkward when you get caught doing that at work. Marc Jacobs Woman. On their site, it’s described as “Marc Jacobs reinterprets Gardenia.” Its notes are gardenia, wild muguet*, skin musk, cedar, and ginger. It’s style is described as “lush and watery all at once” – whatever that means. On me, it smells like musky powder and fresh ocean water and the slightest whiff of flowers. How did it win out? 1. I was overwhelmed with scents when I returned from that second Sephora shopping trip, so I tried scrubbing the Tocca and Marc Jacobs off my arms. The Tocca completely went away. 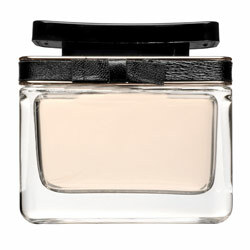 The Marc Jacobs stayed – albeit slightly milder – and I still smelled it after the whole day and a 30-minute workout. A clear winner in my book. Did you always plan on sniffing out a wedding-day fragrance? Or was it a last-minute must-have for you? What are some of your favorite day-to-day fragrances — because seriously, owning perfume makes me feel very adult and I might want to start doing this in real life. *lily of the valley… I think. I turned 31 this past weekend – and I can’t imagine a better time to get married. There was always a stigma in my family for those who were deemed “too young to marry.” When my cousin B got married at 28, that was all anybody in the family talked about – he’s so young. Why now? Can’t he wait? That seems to have been the prevailing wisdom in the late ’80s and throughout the ’90s, at least. Most people I knew (and basically, the only people I “knew” back then were family members) were waiting until their 30s to get married. When my other cousin, M, got married in her late 30s, she seems to have crossed that barrier between “just right” and “come on, all ready” – but even her path was more well-taken than B’s. I don’t know precisely when the tides shifted. Maybe they never did – maybe my view of marriage has been skewed, nonexistent. But skimming the bios on Weddingbee, it seems that 30-something brides such as myself are in the minority. For the record, I don’t believe there’s a “too soon” or a “too late.” I believe “just right” occurs when two people who can tolerate each other are emotionally ready to handle marriage – not just the pink high heels and lace-bordered stationery and great photography and yummy cupcakes of a wedding day, but an actual marriage, with warts and bumps and fights and silences and jealousy and hurt feelings and kids and burnt meals and debts and terminal illnesses and all. My role models growing up – my parents – were like that. They weathered it all, because they were ready when they got married. The fact that they were “over the hill” in the 1970s – in their late 20s – doesn’t have anything to do with them being ready. They just were. But when I crossed 25, all my logic and understanding about “being ready” – and all my knowledge that I most certainly was NOT ready – went out the window, and I began wondering why I hadn’t yet found The One. Women younger than me were marrying left and right. Even those my same age or older had been with their partners since their early ’20s, it seemed. 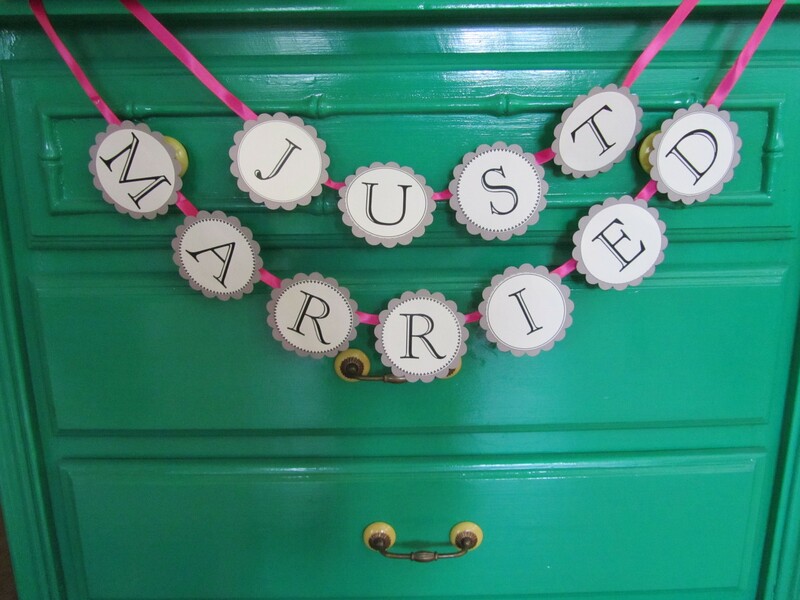 And as the years ticked by, I began wondering whether marriage was part of my journey. For a bit, that was fine. I had plenty of companionship in my friends. I didn’t want kids (I thought, at the time). I was terrible at relationships anyway. 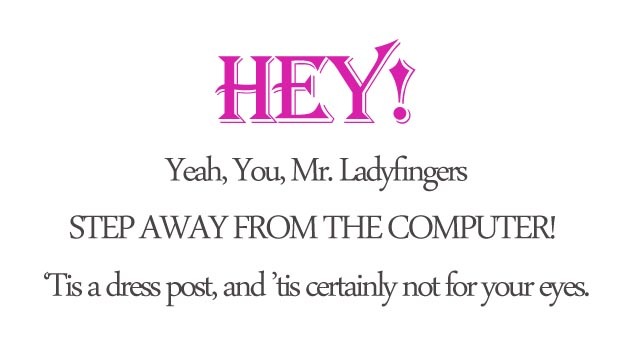 But then I met Mr. Ladyfingers a mere two-and-a-half years ago, and my One had been found. Turning 31 means a lot of things to me. Growing up, for whatever reason, I didn’t believe I’d ever reach adulthood. I was so pessimistic as a child – again, for no reason whatsoever – that I’d lay in bed hearing planes overhead and believe we were under attack. I thought the world would end before I was in my 20s, much less my 30s. I couldn’t fathom it. In my early 20s, I believed that if I didn’t find Him by the time I was 25, I never would. And if I did, I’d meet him once I was too “old” to have children. Whatever that means. In my late 20s, I once again believed I would never make it to my 30s. This was a combination of some crippling depression – a topic for another time, maybe – and some pretty shady life decisions that may have fulfilled my fears. And now, at 31, that all seems a distant memory. I can picture 35, 40, and beyond. I now know I’ve found Him, whether we can have kids or not, whether we fight or not, whether things are perfect or not. And I’m going to marry Him – not just have a wedding with Him – in just over two months. If I had been ready to do this when I was 21, I would have. If it had taken me until I was 41, it would have been worth it. If you’re out of your 20s and just entering bridedom, how do your feelings today match up with your feelings of yesterday? What are your views on what entails being “ready” – and how did you know you were “ready”? 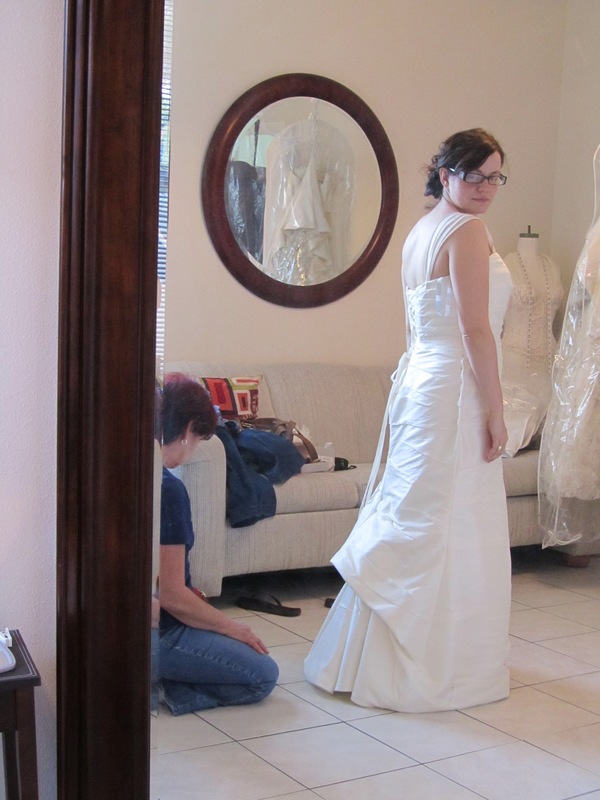 I’ve written before about how vain I’ve become since planning a wedding, all in the name of looking my best on the wedding day. Lately, I’ve taken that in weird directions – like, growing out my eyebrows because I’d like to get them professionally shaped and waxed a few times before the wedding. I feel weird, like people are going to start asking me if I’m OK. I mean, things are getting hairy up there. But I digress. I’ve struggled with cystic acne in my past, and had finally, finally landed upon a skin care routine that worked. Is my skin perfect? Definitely not. Do I break out anymore? Rarely, if ever, and never for more than a day or two. For somebody with such a long history of dermatological heartache, this is a bigBIGbig deal. But then, I started to pick on myself, examining acne scars on my forehead and cheek, dullness here and there, and blackheads around my nose and on my chin. I felt I could look better. I wanted that natural bridal glow. 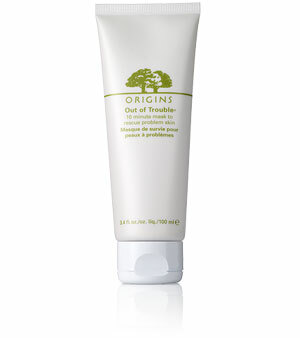 I took a trip to my local Origins three months ago to buy some magical products that would give me perfect, porcelain Barbie skin. I told the sales consultant I was planning a wedding. I walked out about $150 poorer. 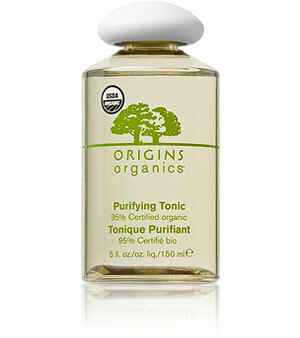 Some of the things are definitely keepers – like the Purifying Tonic. I’d also go back and buy the Out of Trouble Mask they gave me samples of. But the rest was just… meh. I got the Skin Tone Correcting Serum and the brightening peel pads from the Brighter by Nature line. They didn’t do any harm, but after two solid months, I didn’t see a difference. And then there was the VitaZing tinted moisturizer, which was… yuck. Grease city. I bought some St. Ives Naturally Clean Apricot Scrub after reading rave reviews, and used it every other night, as recommended. I noticed my blackheads shrinking! Yay! So, following my lifelong philosophy of, “Some is good, more is better,” I really went over the deep end. I stopped using the Brighter by Nature products and upped the St. Ives stuff to every day, sometimes twice a day. I lost all sense and started using my old standby, Differin acne gel, just to totally clear out some whiteheads. And then I did my twice-weekly mask on top of it all — and the next day, it was scab city. Seriously, chicas: My skin FREAKED THE #@!& OUT. I didn’t have pimples — they were more like hives, or like very dry, flaky mosquito bites. When I put my toner on, it burned – not tingled — but burned. Clearly, my skin hated me so much it was going to explode right off my face and run away. So, I’ve adopted a new philosophy: Naked skin. No superfluous makeup besides my mineral powder and blush – no primer, no illuminator. Closer to the wedding, I just may follow Mrs. Dolphin’s cue and go totally bare faced. This is a really bold move on this part. We’ll see. Next, I’m only using the products I know work for me, and in the combination I know they work best – Purpose face wash twice daily, Origins Purifying Tonic twice daily, Murad Skin Perfecting Lotion in the mornings, a little Differin all over if things start getting crazy. And no more drying stuff on top of drying stuff. That, along with the buckets of water and green tea I’ve been drinking, has significantly calmed things down in the past three days. It’s a big relief not having to play junior chemist for now, and knowing that I’ll have that bridal glow with no more *fingers*crossed* red meanies. Did you have any worrisome flareups as you got closer to the wedding day? What was — or is — your plan to keep up that glow in the final few months? *Please, I’m being sarcastic. This is totally not recommended. I’ve been quite the busy bee, hive, with my border punches and my pewter ribbon. I’ve been knocking out projects left and right, and I’m so far feeling pretty good about my ability to meet the goal of getting everything done by the week of the wedding. 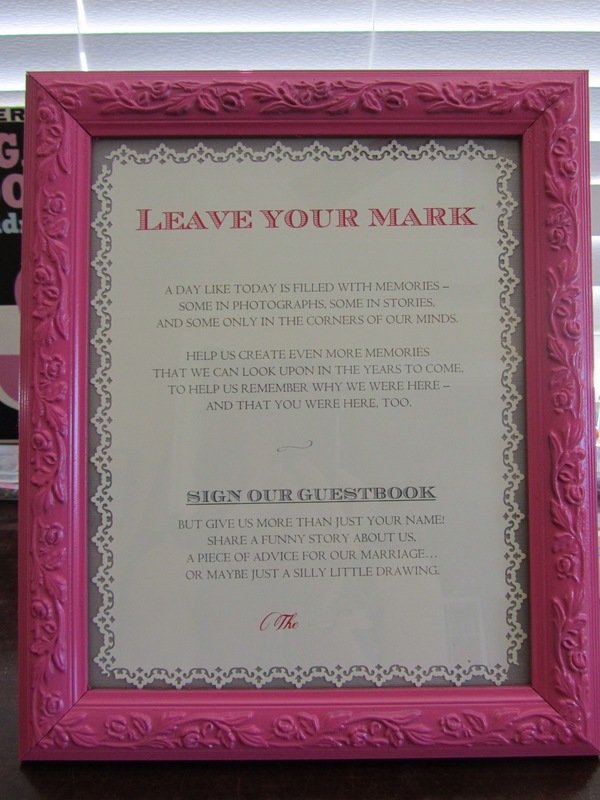 First up, the guestbook sign. I was inspired by Miss Parasol’s sweet guestbook sign, and whipped up our own little version in just a few minutes. Next was finding the right picture frame to house it. After trying out a couple of too-big options around the house, I randomly stopped by Goodwill on my way home from work last week, and — lo! I found The Right One as soon as I turned down the frame aisle. 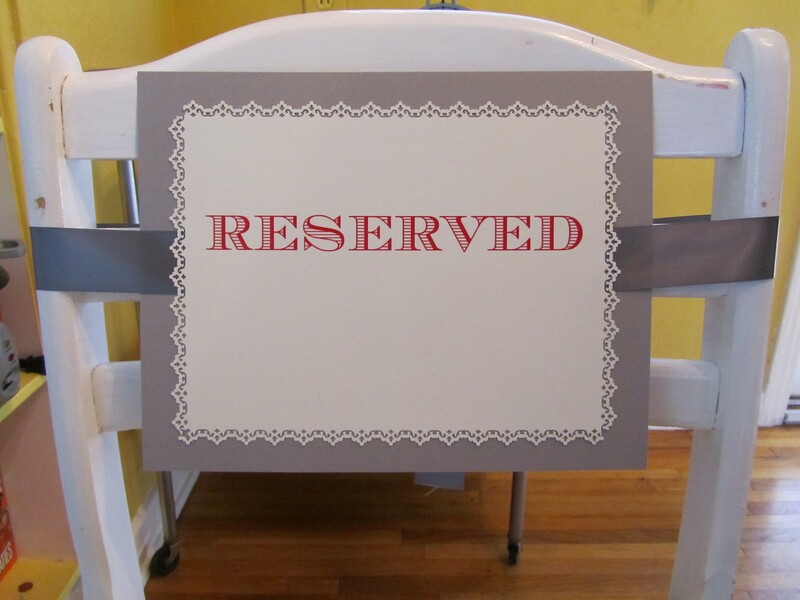 Add some spray paint, some gray paper in one of the shades used throughout the wedding paper goods, and some lace border punch, and we have our guestbook sign. Then, another project that just took about 30 minutes to put together. I used the same font from our cards and guestbook sign (and which also appears on our farewell bell tags, coming to you at a later date) – Chevalier – and made these really plain and simple. Again with the lace border punch, some more gray paper, and the pewter ribbon that made an appearance in our invitation suite, and sheBANGS! 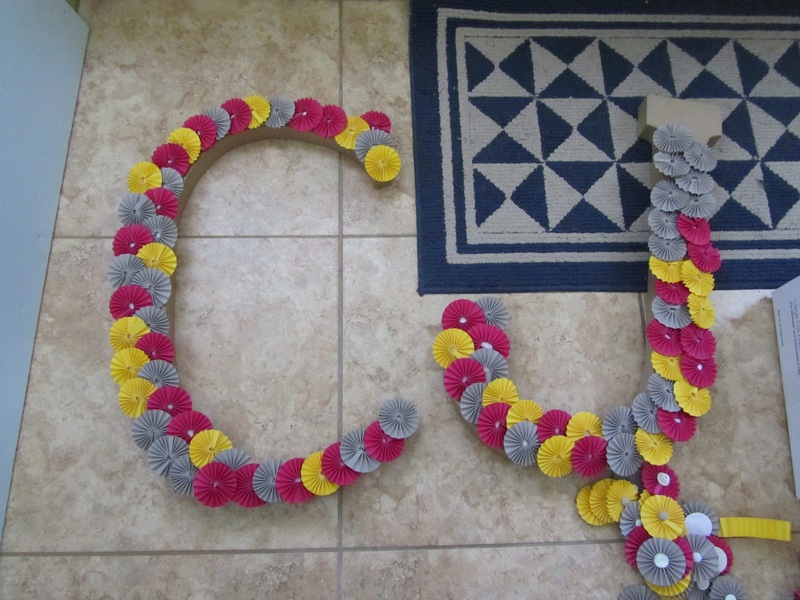 Finally, I bought our paper mache initials at Joann for our reception decor initials, and did a quick mockup of the pieces using the paper flowers I’d already made. And such super awesome news — I only have 10 more paper flowers to make before we can finish this baby up, and then just about 40 more for the programs. Yahoo! We have JUST ENOUGH scored strips on the ready to get both of these babies finished, so there’s a light at the end of the tunnel on the paper flower tip. And thank goodness, because they are a pain. Want a sneak peek? Knocking all these projects out really cements the wedding look in my mind, and I’m getting super excited to see everything working together. In the beginning, when I was dreaming up vague themes and color schemes, I wasn’t really sure I could pull this off. I thought it would look like a carnival — and not like a fun, quaint, vintage carnival with candy apples and dreamy trapeze artists. More like the carnival that occurs when one slaps together a pastiche of every idea ever culled from a wedding blog, ever. But hark! The vision is coming together, and I’m thrilled with how it’s all jibing. Did you find yourself sparked by a newfound enthusiasm after completing just a few projects in a row? Did your wedding-day vision elude you at first and start gelling closer to the date? About six months ago, I saw a photo of a wedding project where the bride and groom had used their engagement photos in aisle endcaps. I loved this idea for many reasons: Since we hadn’t done save the dates or engagement announcements, we really hadn’t gotten a chance to use our e-photos, and I’m kind of obsessed with them. I also knew we weren’t going to have much of a budget for our ceremony decor, so flowers were out of the picture. With a garden wedding, flora probably won’t be missed, but I did want something to fancy things up. Hive, I searched and searched for that original inspiration pic so I could show it to you. Apparently I hadn’t saved it on my hard drive, printed it out, or bookmarked it. I Googled every combination and searched every wedding site I frequented. So I’m now convinced the whole idea came to me in a dream. Which is fine. 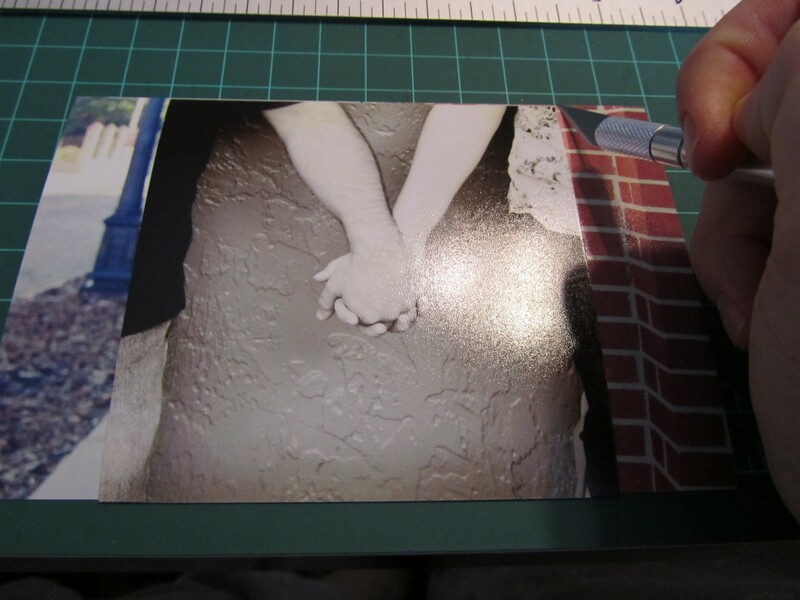 First I had to cut all our engagement photos to the same size. Since some were vertical and some horizontal, I just placed a horizontal shot over a vertical one, moved it so it framed the section well – no cut off heads, etc. – and made little marks. 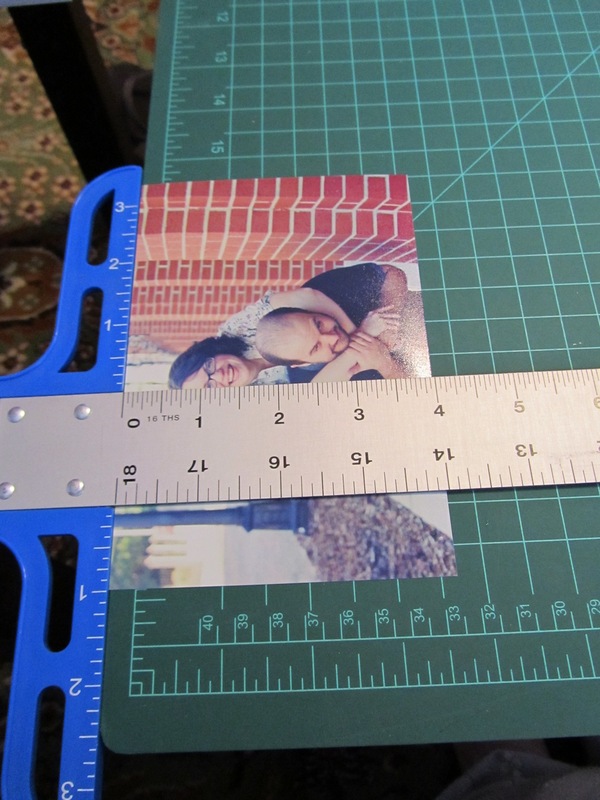 I did the same vice versa, and then cut them all to size with my X-acto knife, cutting mat, and a T-square. 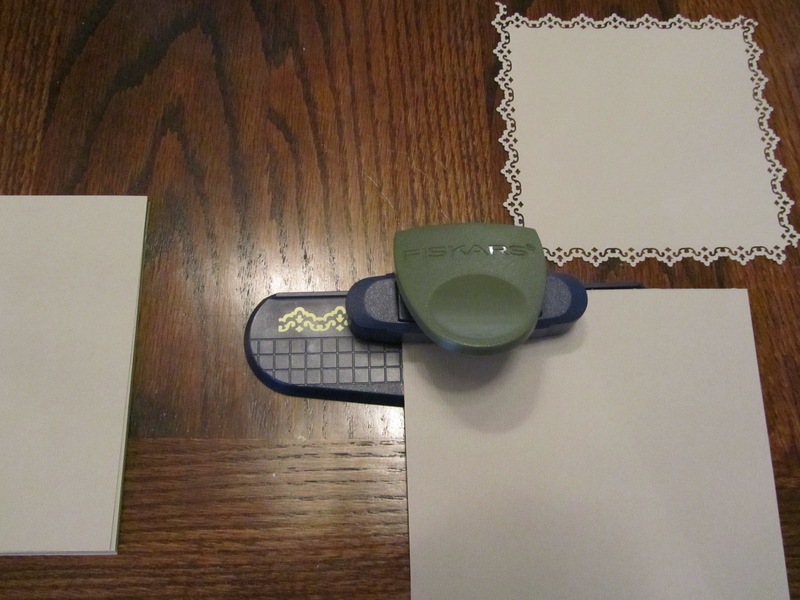 My personal paper cutter’s blade is starting to dull, and I wasn’t sure I could swiftly cut through the photo paper, so I didn’t leave much up to chance. 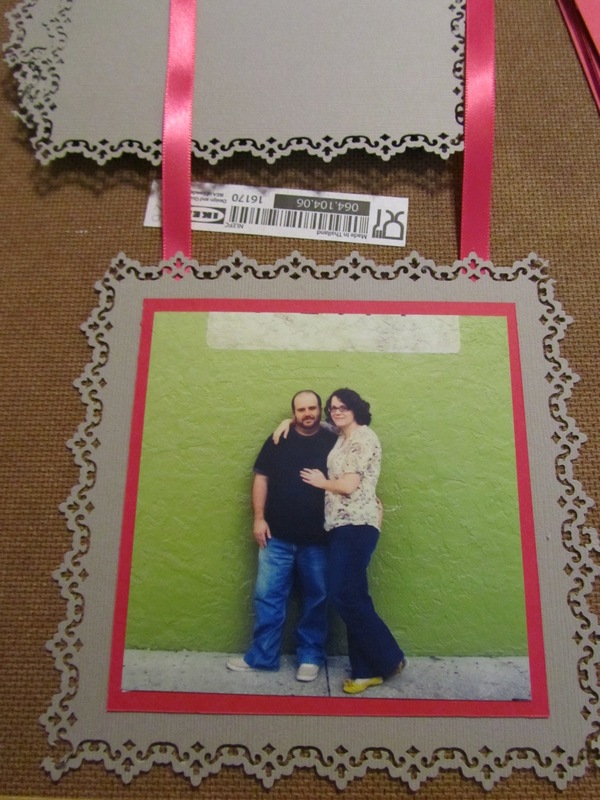 Then I placed an e-pic over the gray paper and marked off 1″ on all sides to give it a decent border. 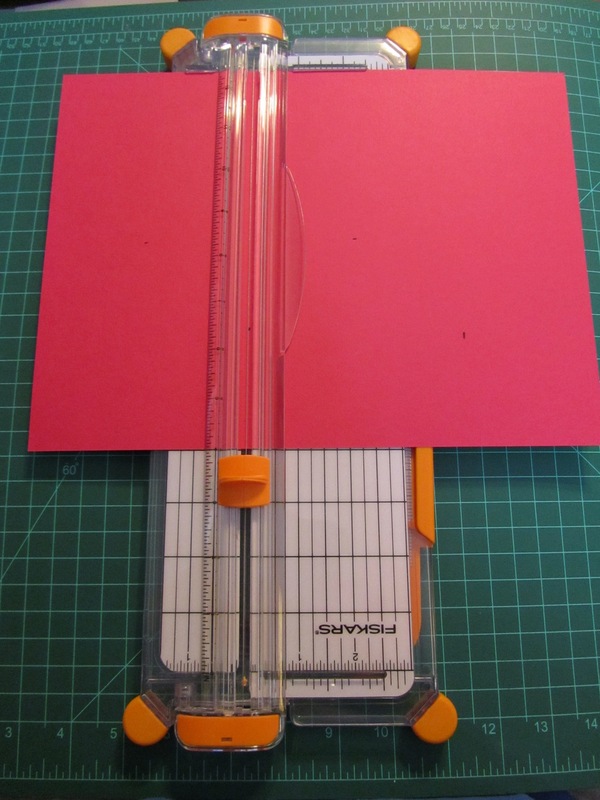 I used my small paper cutter here. I did the same thing with the pink paper, marking about 1 cm on all sides so there would be just a hint showing. 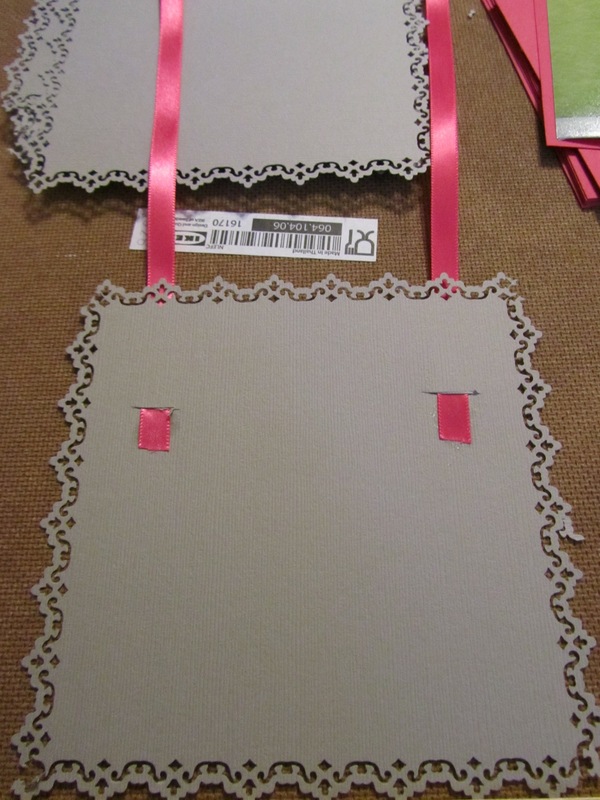 I punched a lace border around the edges of the gray paper with the lace border punch – it was kind of tricky to get the corners just right, but even if they’re not perfect, it’s barely noticeable in the context of a lace pattern. Then I just basically eyeballed a location for two little slits in the gray paper, where one end of the ribbons would be secured. I stuck one end of each ribbon in each slit, and secured with a little bit of Zip Dry. I wanted to be able to leave the other ends loose to tie however loose or tight they’d need to be to stay on the chairs, rather than relying on one continuous ribbon piece that would simply hang, and might blow off if there was any wind. Finally, I glued the pink piece down with Zip Dry, and glued the photo on top of that. I’m really excited about how these turned out – pleasantly, they’re better than they were in my mind. 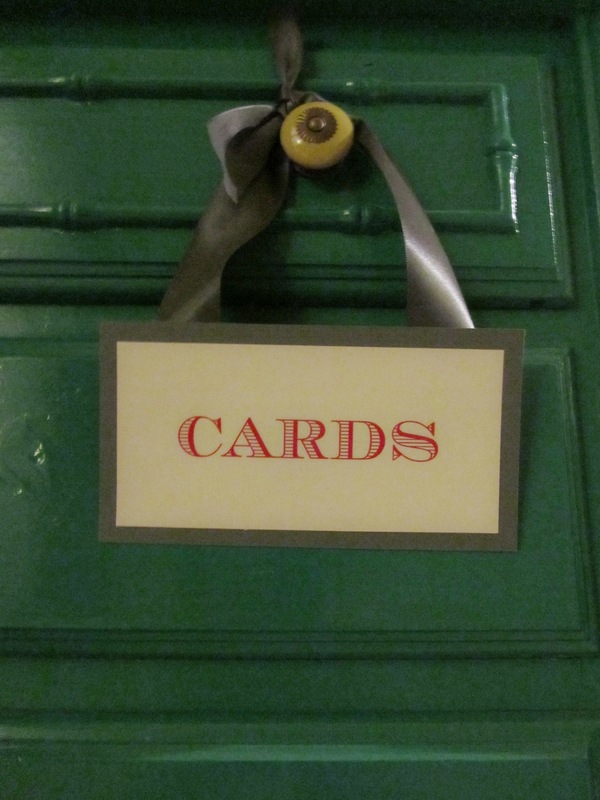 And while I was at it, I whipped out the card box sign, also. Since we’re using a bird cage, I built the ribbon here to act the same way as the aisle endcaps, so it could be tied around one of the bird cage spokes, etc. Sorry about the crappy picture – I’m impatient and apparently can’t wait until the next day, when there’s decent light. Did you take on a lot of paper projects? How are you handling your ceremony decor? 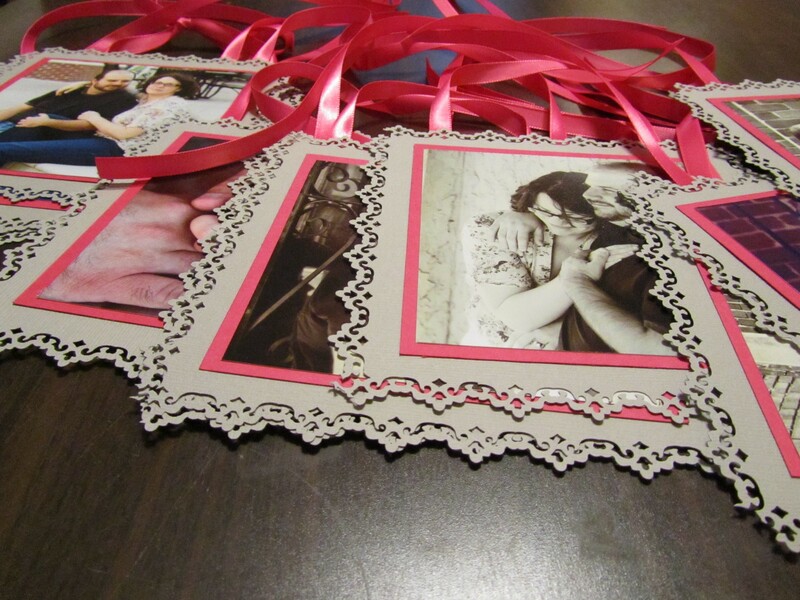 Are you using your engagement photos in any decorative way during the ceremony or reception? In the midst of making our engagement photo aisle endcaps for the ceremony, I found myself spitting out a bit of a euphemism. And it got me thinking. Much like there’s a secret code-speak in the real estate world (cozy = shoebox, quaint = walls are falling down), there seems to be a bit of a cipher going on in the wedding planning world, as well. And I’m not the only one who’s caught myself saying what I don’t mean – vendors do it, too. So to help you newly blushing brides to be navigate the murky waters of wedding planning doublespeak, I present to you, the Wedding-to-Real-World Translation Guide. Do you find yourself engaging in wedding planning doublespeak? Have you been a victim of the vendor code? It’s a funny thing, my creative spark. For months, it lies dormant, hatching half-baked ideas that go nowhere as I struggle to figure out such pressing logistical issues as the best type of adhesive to connect fabric with paper (Fabri-Tac, as long as your fabric isn’t so thin the glue will seep through) or whether to buy a 2.75″ or a 3″ hole punch for our “just married” sweetheart table banner (verdict: Both). 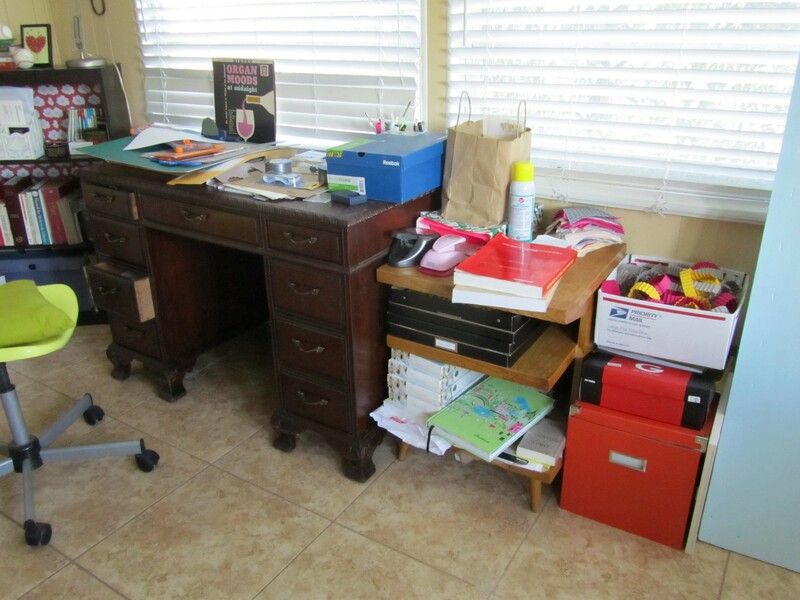 It gets me really excited and incites me to buy roughly three-quarters of the supplies needed, whereupon said supplies sit in a sad pile in my craft room/office/mudroom/catchall eyesore storage space. But then, all of a sudden, the creative spark is stoked by a sudden wave of oxygen, and my mind is suddenly aflurry with idea upon idea! All of my previous questions are suddenly answered, and I understand how to complete all the half-finished projects lolling about our home. This is both awesome and awful at the same time. I feel super productive and also smart because I’ve figured stuff out. As I get stuff done and gel ideas more clearly in my mind, I can finally visualize everything in the wedding together, at once, and it’s wonderful! I get to buy things. With completed ideas come new ideas. Lots and lots of new ideas. For stuff I never considered doing. In the past week, I’ve completed our “just married” sweetheart table banner and “love is sweet” cupcake table banner; designed and printed our ceremony chair “reserved” signs, tags for our farewell bells, guestbook table sign, and cardbox sign; and developed a fully baked idea for our ceremony aisle decorations. As for these banners, they were ridiculously easy. 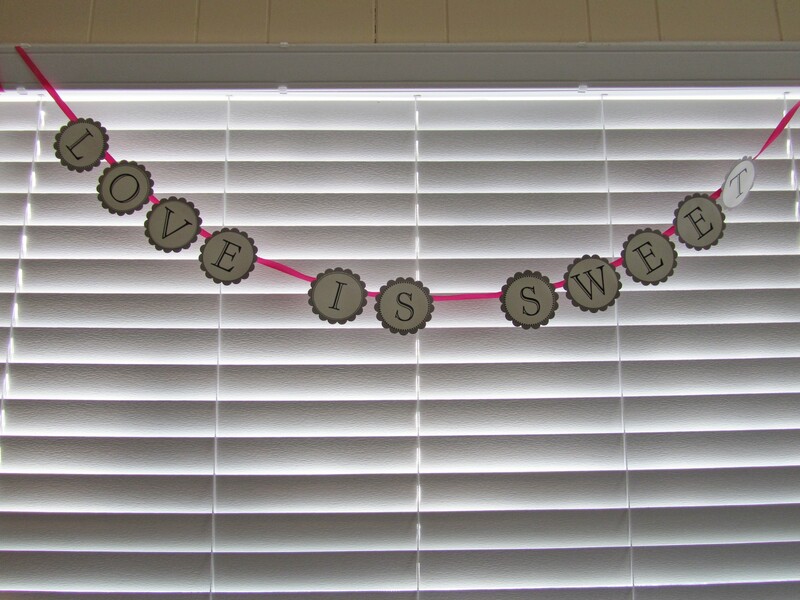 I downloaded this template from MarthaStewart.com and used a 2.75″ circle punch to cut the letters out, and a 3″ punch to cut out the scalloped accent papers. The 2.75″ punch wasn’t quite big enough to capture all the border detail on every letter, but I didn’t mind so much for what I wanted to do. Then I cut tiny slits in the back of each accent paper circle (the gray), threaded the ribbon through the slits, and glued the letters on top. This glue was enough to keep the ribbons in place, too. I also decided – surprise! – to do programs. I blame this on Mrs. Tartlet. How could I look at those gorgous beasts and not want some of my own? 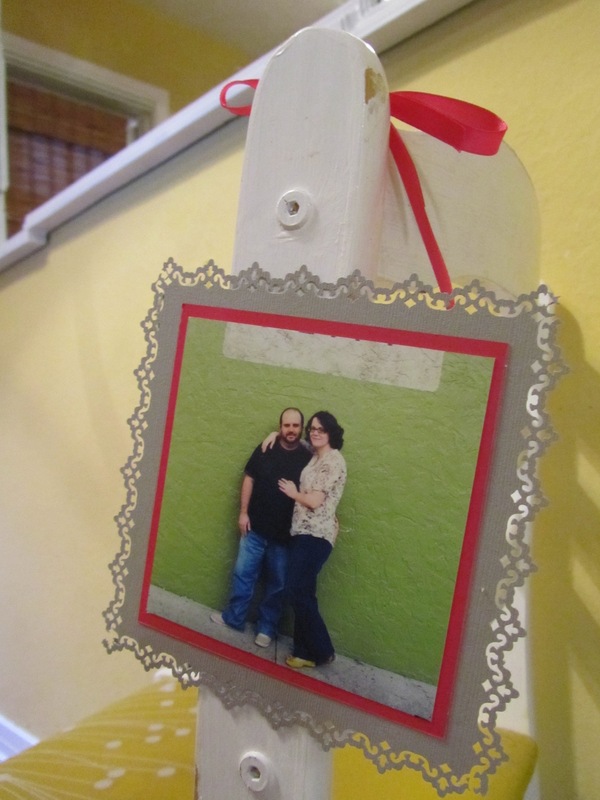 Plus, it’s a fabulous way to incorporate elements from our reception decor and our invitations. Designing the programs also helped me finish our ceremony and select our prelude music and music for seating the family. Woot! I’m pretty stinkin’ excited about knocking out all these projects and gearing up for others, “awful” and all. The girls and I are planning a crafternoon (yep, I said it) later this month, so I have a feeling much much more shall be revealed in weeks to come. Did you have a scary period of inactivity followed by an equally scary pop of productive creative frenzy? And this last one’s a rhetorical question, because I know you totally did, but – did you take on projects in the final months that you swore you wouldn’t be do once upon a time? Like, oh, programs? 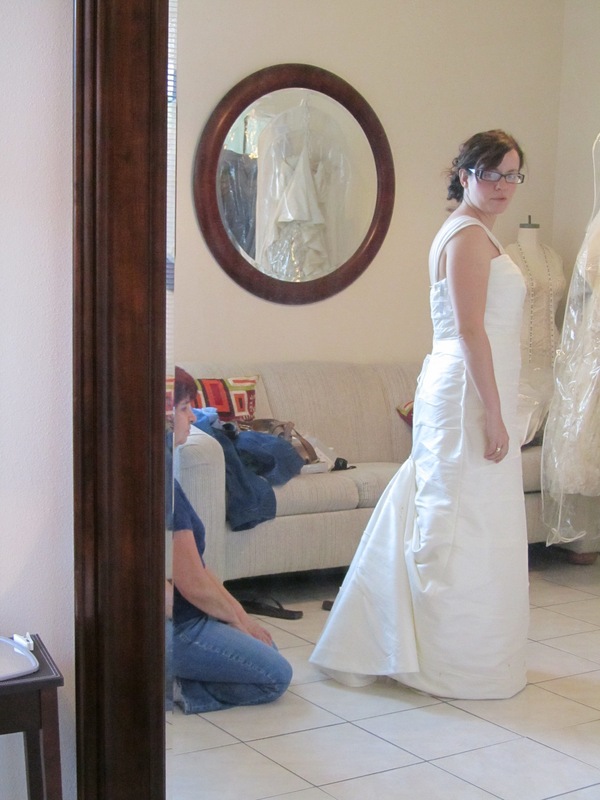 The dress is being hemmed and tucked. The shoes are safely hidden away on a top closet shelf. My jewelry has arrived. Oh, yeah. Check out my bracelet. I spent agonizing hours searching for the perfect jewelry. I looked at necklace after necklace. I considered clip-on earrings for my non-pierced ears, or converting regular earrings to do the job. 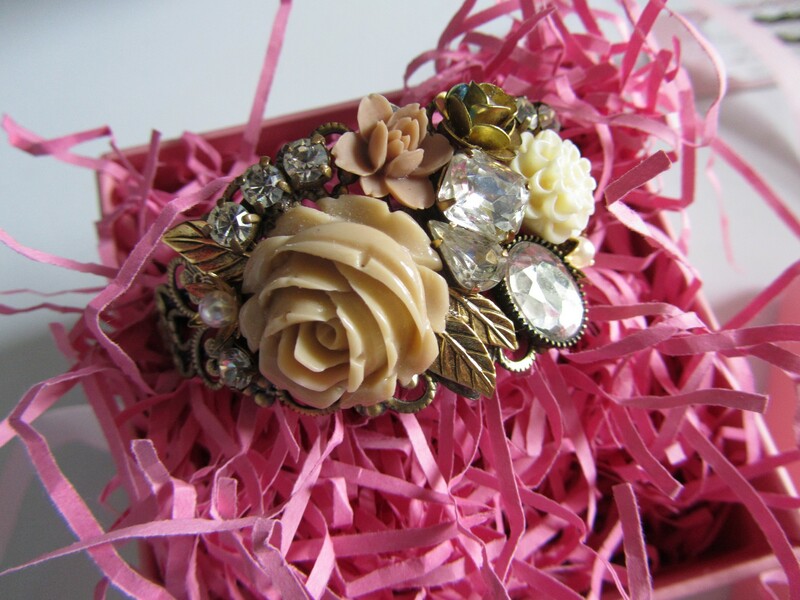 Finally, after deciding against none of those, I scoured Etsy and divided my finds into 3 categories: gold and delicate, rhinestone bling factory, and this subset of floral collage cuffs. Etsy seller TattyChic whipped this design up in one night, hive, and made it live and shipped it in just one more night. I’m so, so happy, and consider it a good choice when I have to restrain myself from donning something before the wedding. Anyway. Now that I’ve made all my attire purchases and collected hair and makeup inspiration pics to discuss with my stylist at our September trial, I’m left with a big fat burning question: Does my hair piece still work with this look? OK. The hairpiece: I bought it with the dress in January. It was kind of an impulse buy, because the consultant put it on my head and, together with the dress, the vision clouded my judgment a bit. It’s not that I don’t love it. It’s just that I bought it before my vision was fully formed, and now I’m not sure it fits with everything else. 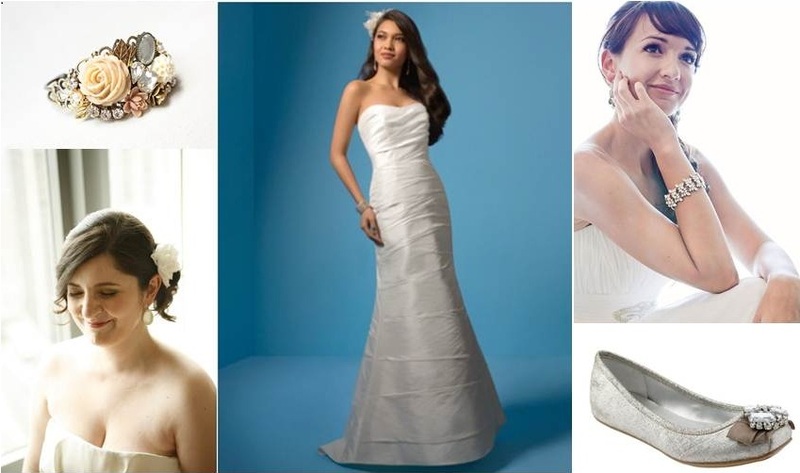 Here’s a mini inspiration board showing my dress, shoes, and bracelet, along with some leading hair and makeup inspiration pics. It’s not that I don’t love it. I really do, and it’s exactly what I want in my hair the day of — sort of. My concern is the feathers make it a bit too modern or glam — or even too “Old Hollywood” — for the “romantic garden” look I’ve built with everything else. However, it does have some small rhinestones and pearls, so it echoes elements of the bracelet and the shoes, too. And, I don’t know… feathers, birds, gardens. It might work. Perhaps I’m being picky. So, what do you think, hive? Keep the hairpiece! It goes perfectly with the rest of your look. 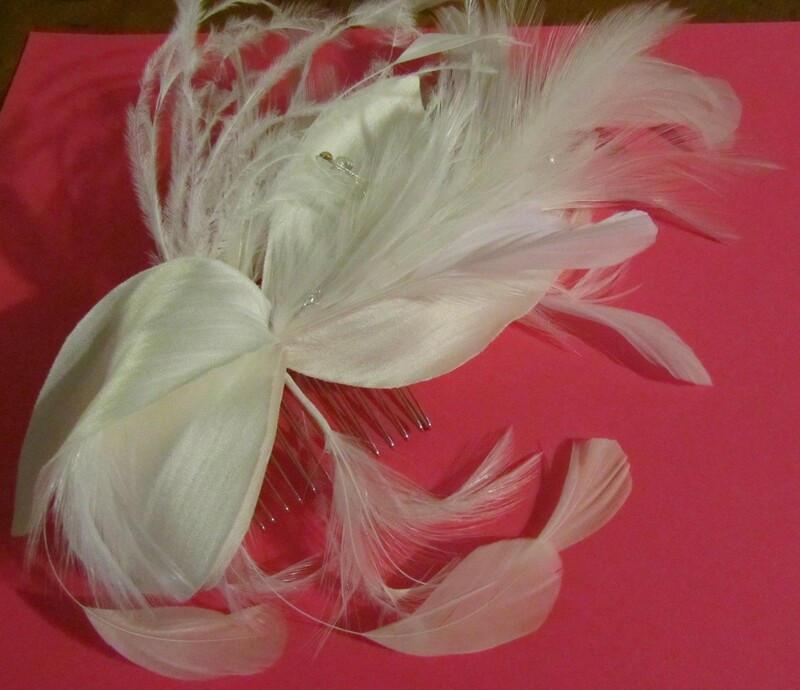 The feathers don’t work with the rest of the look – try to find something similar sans Tweety parts. Did you struggle with “finishing” your wedding day look? I always forget how much I love my dress when I’m away from it for too long. BM Spotlight has been storing it at her house (and promises me she’s only worn it twice… I think she’s joking). Then, I put it on, and fall in love all over again. I’ll be hanging out with two of my soulmates at the wedding, hive: Mr. LF, and this dress. I picked up my dress from Spotty on Friday night, and went to visit my seamstress, Daisy, on Saturday morning with MOH Ginger. Daisy came very highly recommended on local wedding boards, and judging from my first meeting with her, I’d extend this recommendation as well. The first big surprise: My dress is now three sizes too small!! Poor Emma now hangs quite loose on me. No worries: We’ll put her on a steady diet of nips, tucks, and hems. This is the part where ‘ger made me stick my shoe out and don my hair flower, while I tried to keep my naughties in place. 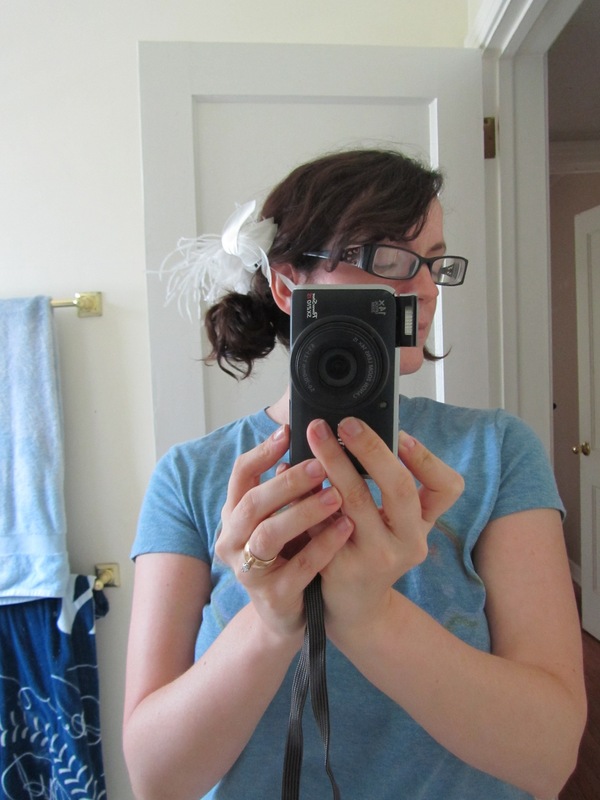 Also, I totally did my hair similarly to how I want it for the wedding. Yeah: I’m a geek. 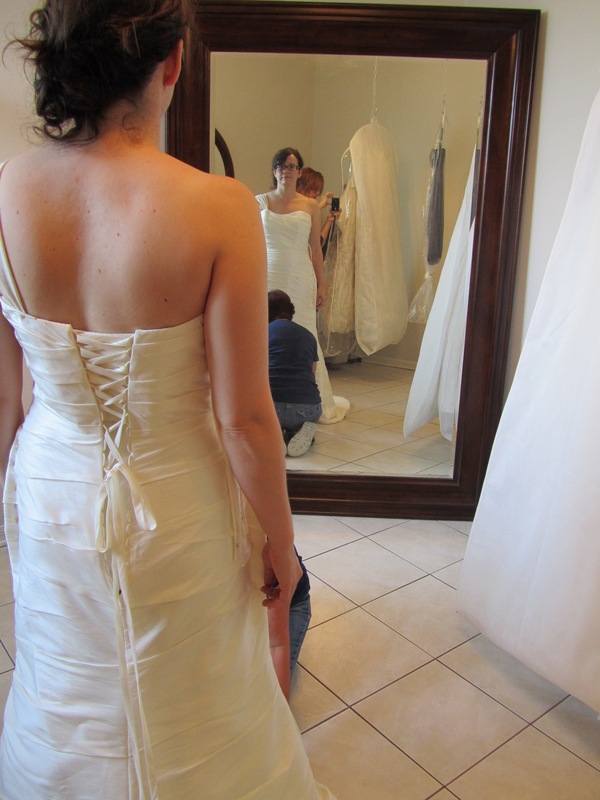 After Daisy pinned the sides and talked about taking in the top, as well, she got to work on pinning the hem and showed me my bustle options. I loved both of them so much! First, there’s the one-point overbustle. This is a good budget bustle, and I actually really liked how it looked. 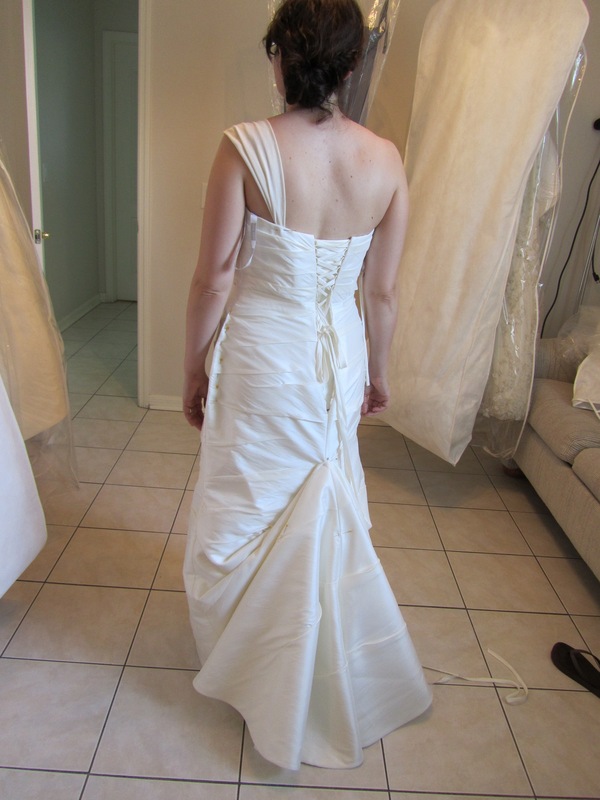 I’m a little in love with the way my dress draped in the back. Being so picky, I haven’t been in love with a lot of bustles I’ve seen – but oh, hive, I loved both of mine. 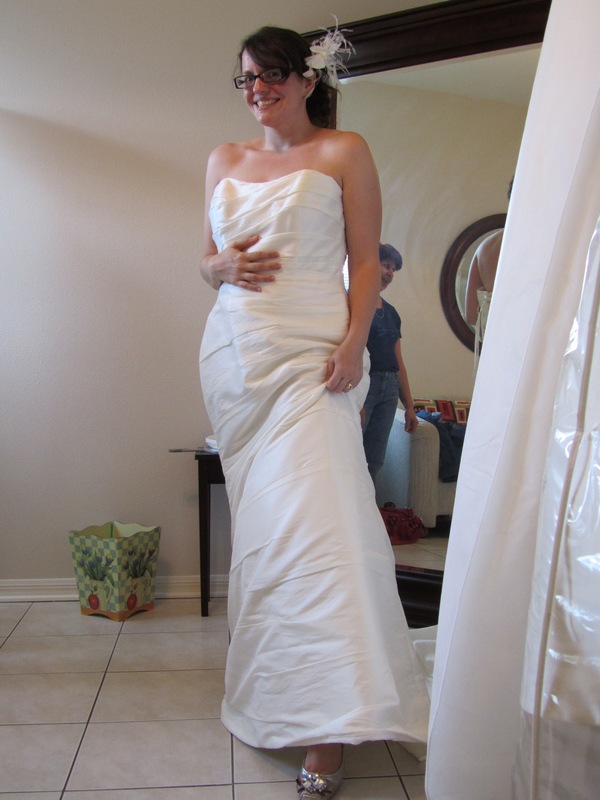 This one would secure with a button – but she did say it has a tendency to come undone throughout the night. She also told me a scary story about a girl who had a really complicated bustle done and the wedding coordinator was so frazzled that instead of doing the bustle, she secured it with safety pins. Needless to say, the dress lining ripped and the makeshift bustle came out, and she ended up with holes in her $4,000 dress. So, rule: No safety pins. I was sold on the overbustle, but she asked if I wanted to see my other options. So she did up a French bustle. This confused me because I fell in love with this one, as well. I made poor Daisy go back to the overbustle so ‘ger could take pictures, then the French bustle again. Ultimately, this one won out – when I saw the overbustle again, after having seen this one, there was no contest. I liked the cleanliness of this one, and the little draping underneath felt like a surprise to me. This one will only have three points, secured underneath with color-coded ribbons, so it should be fairly easy for the girls to do me up. Let’s just look at the dress one more time, hm? It was such an exciting day! I do so love reuniting with Emma when I can, and it always feels like we’re meeting again for the very first time. Daisy should have all the above alterations (plus cups sewn in so no stinky bra for me!) in about a month, and then will lovingly look after Emma until the week of the wedding, when she’ll press it and have me pick it up. Until then, Emma… remember me. 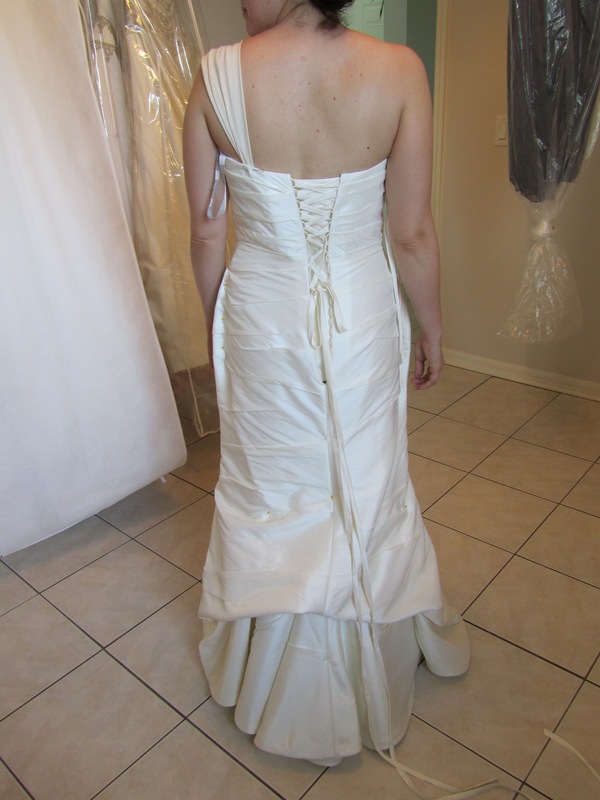 Are you planning any major alterations for your dress, such as adding sleeves and the like? What’s your stance on different bustle types? We’ve been engaged for 229 days, and I’ve only just begun thinking about the ceremony. This should be shameful, but really, it’s not because I’ve found cupcake choices and belly bands to be of more importance. It’s just because our ceremony is relatively straightforward – no readings, ring warming, hand fasting, high masses or moments of silence. Our goal is 20 minutes, end to end. However. This past weekend we had our first meeting with the Reverend who will be marrying us, and he’s given us just a bit to think about. For one thing, Mr. Ladyfingers has recently revealed to me that, all this time, he was under the impression that we were writing our own vows. Cue freak out. I’m didn’t freak out because I’m against it. 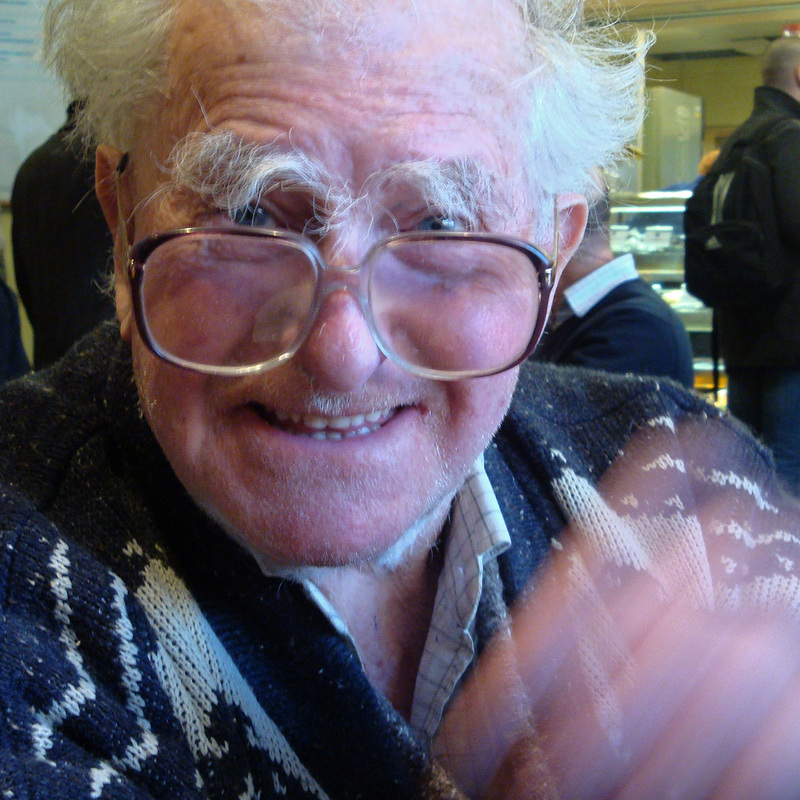 In fact, this came up precisely because I asked him what he thought of the idea. After reading lovely stories like those of Mrs. Tarlet and Mrs. Cardigan’s, I thought personalized vows would be a nice touch for two writers such as ourselves. No – I just freaked out because it was another thing to do, and really the MOST IMPORTANT thing to do, aside from getting the marriage license and showing up. He loves me even though I’m a complete lunatic sometimes. His patience continually floors me. He’s kind and loving to those he loves and wastes no time on playing games or posturing for those he doesn’t know. He dedicates his time and effort where it’s most important, and he’s very real. This may sound weird, but the way he acts with our dog makes my cold heart melt, and I can see the way he’ll act with our children. It’s all just so precious. I’ve never felt more comfortable around and at the same time more passionate about another human being. In fact, I didn’t think it was possible. He totally gets me. There isn’t another human being who gets 100% of what I say, all the time – stupid jokes, weird references, and all. Among other things. See? My love is relatively easy to explain. I’m largely using Mrs. Jam’s “I love you because…because I love you” template that so many others have relied upon. It’s pretty foolproof, no? The next matter at hand is the actual type of ceremony we’ll be using. Rev. Shook has given us three options: A classic religious ceremony, a contemporary religious ceremony, and a nonreligious ceremony. We can also mix and match elements, add our own, etc. We’re taking practically nothing from the classic religious ceremony, only because it doesn’t really match our style. But we like certain elements from the contemporary religious ceremony and will likely mesh that with the nonreligious version. And can I just say? Reading any of these ceremonies makes me bawl my babypants eyes out. Which may also be a big reason why I haven’t started thinking about the ceremony in detail until like, last week. One thing we’re doing that neither of us had seen before is the blessing by both sets of parents – not just my dad. After I’m in place with Mr. Ladyfingers, facing one another, right hand in right hand, the Reverend will ask my father and Mr. LF’s parents to stand, and ask if they give their blessing in our union. Hopefully, they’ll all say yes and we can get on with it. We like this a lot, because it’s important to us to involve our entire family in the union. We briefly considered a ring-warming ceremony, but decided I would be too nervous with our rings being passed around among 80 of our nearest and dearest (although I do really like how Mrs. Hippo finally arrived at a workable solution). Not that I don’t trust them, and since we’re not having kids there, the rings would probably stay out of our guests’ mouths. I just don’t want to take any chances or sit there obsessing about one more thing than necessary. As I’d mentioned before, the issue of the ceremony arch has been taken out of our hands by Mother Nature, and we’ll use two palm trees at the far corner of the ceremony lawn as our focal point. And as for decorations? 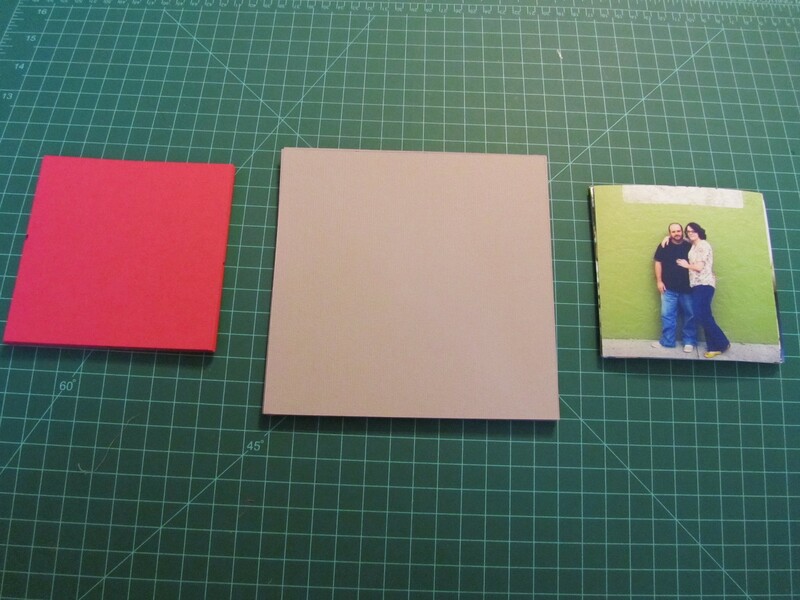 I’ve got a little something up my sleeve that involves engagement photos, paper, and a border punch – STAY TUNED. I’ve been a paper crafting fiend lately and I’m pretty excited to start showing off my stuffs. What path did your ceremony planning take? Did you involve friends and family in readings? Did you include cultural or other special traditions to make it your own? I love hearing these kinds of stories – and you never know. It could totally change my mind about what to include.